#20 SIS Kids Are Doing It For Themselves: Meet Veronica! 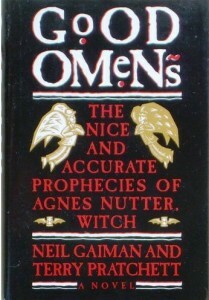 My favourite book of all time is Good Omens by Neil Gaiman and Terry Pratchett. However, I have quite a love for pretty much anything written by Douglas Adams, and Jane Eyre wins out in the category of Classics. 6. Do you own an eReader? If so, is it cool? I have an iPad app with a few too many eReader apps… Kindle, Stanza, iBooks… and so far, all the books I’ve got on it are ones I also own. I’m actually reading Game of Thrones in hard copy and on my iPad right now, reading from one when I don’t have the other. 7. If you weren’t in library school, what would you be doing RIGHT NOW? I would still be trying to find work in film production in Montreal. It’s notoriously difficult to get your foot in the door of the film production industry, and all my networking would help in Toronto or maybe even LA, but not here. 8. What is your dream job? My Dream Job would be film and media librarian/archivist at the NFB, a film company or with a tv network. 9. What is your dream sandwich? I have been eating so many of La Prep’s Chicken Pesto sandwiches you’d think that was my dream sandwich! But no, I’m not very adventurous when it comes to sandwich making (pasta making on the other hand…) so my dream sandwich is really just a good tuna melt. 10. What is your favourite thing about living in Montreal? History so old it’s practically palpable. Not exactly a feeling you get in Guelph or Toronto… also, I love living somewhere that actually gives me an opportunity to use my french on a regular basis! 11. Living or dead, who would be at your imaginary potlatch? Terry Pratchet, Neil Gaiman, Douglas Adams, Freddie Mercury, Joss Whedon, my fiance and both of our families. Published by Emily Upper on November 1, 2011 at 9:06 am under Uncategorized.